Sri Lanka’s first Science and Technology for Society (STS) Forum will take place from 7 to 10 September in Colombo. Organised by the Prime Minister’s Office and the Ministry of Science, Technology and Research, it is one of the largest gatherings of its kind to be hosted by Sri Lanka. Modelled on Japan’s well known annual STS forums, this event will be attended by over 750 participants coming from 24 countries – among them will be local and foreign scientists, inventors, science managers, science communicators and students. The lineup of speakers includes several Nobel Laureates. It is customary to temporarily suspend our disbelief to enjoy films, novels and other creative art forms. But most of us don’t confuse fiction with fact, even with highly-plausible scenarios. Yet when it comes to real life, as opposed to art, has ‘suspended disbelief’ become a default setting for many Lankans today? Is our society more gullible and paranoid now than it was a generation or two ago? If so, how come? Half a century ago, a Kerala-born science teacher named Dr. Abraham Thomas Kovoor (1898-1978) settled down in newly-independent Ceylon. After retirement, he took to investigating so-called supernatural phenomena and paranormal practices. He found adequate physical or psychological explanations for almost all of them. In that process, he exposed many ‘god men’ who were thriving on people’s ignorance, gullibility and insecurities. That is because mastery over gadgets does not necessarily give us scientific literacy. It involves a rational thought process that entails questioning, observing physical reality, testing, hypothesising, analysing and then discussing (not always in that order). 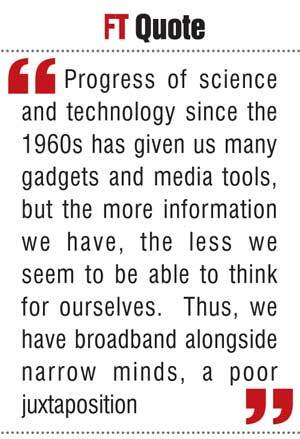 Unless we make scientific literacy an integral part of everyone’s lives, ambitious State policies and programmes to modernise the nation could well be jeopardised. 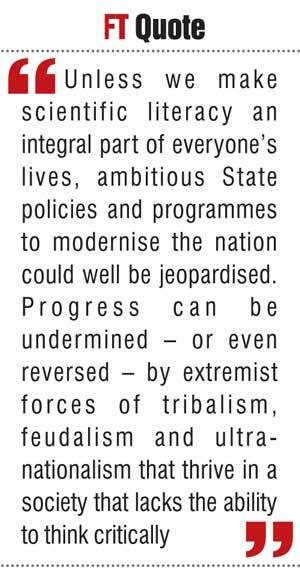 Progress can be undermined – or even reversed – by extremist forces of tribalism, feudalism and ultra-nationalism that thrive in a society that lacks the ability to think critically. Giving everyone a minimum dose of scientific literacy requires a similar marshalling of forces – including civil society mobilisation, media collaboration, creative innovation and social marketing. ‘Science for All’ acquires true meaning only when every citizen – irrespective of education, profession or income level – gets enough scepticism to avoid being exploited by various scams or misled by conspiracy theorists.